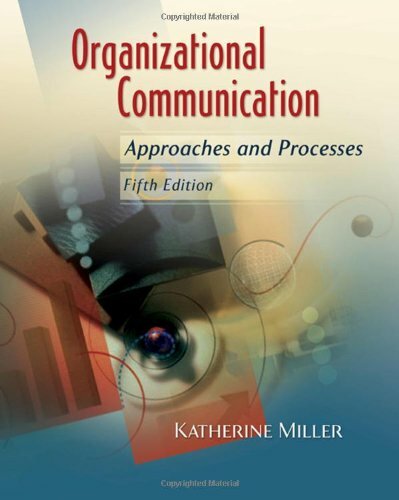 ORGANIZATIONAL COMMUNICATION: APPROACHES AND PROCESSES, 5th Edition presents organizational communication from both a communication and managerial perspective. Professor Miller's clear writing style and consistent use of examples and case studies result in a text that you'll find easy to understand. Dr. Katherine Miller is a leading scholar on communication in healthcare organizations. She holds bachelors and masters degrees in communication from Michigan State University, and a doctorate from the Annenberg School of Communication at the University of Southern California. She served on the faculties of the University of Kansas, Arizona State University, and Michigan State University, and has been a professor in Texas A&M University's Department of Communication since 1998. Dr. Miller is the author of three books and more than 50 journal articles and book chapters.